This black and white photograph shows the Albin K. Longren's airplane plant at 420 SW Jackson Street in Topeka, Kansas. The building ,which is still standing, manufactured at least five different airplane models in its day. The photograph shows the small-scale nature of early aircraft production. 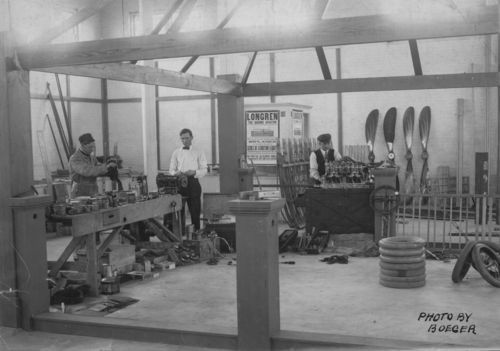 This photograph of Longren's Topeka, Kansas, shop helps students see how simple early aircraft production was. In addition, the photo helps students appreciate the type of labor involved in producing aircraft during the 1910s to 1920s. Finally, the photo can be combined with other Longren related material in order to provide a more comprehensive view of Longren's accomplishment and impact on aviation.